As part of the total rewards for working at Syracuse University, the Office of Human Resources will offer a Benefits Fair featuring a variety of resources for being healthier at work and at home. The event will take place Tuesday, Oct. 30, from 11 a.m.-2 p.m. in Goldstein Auditorium in the Schine Student Center. 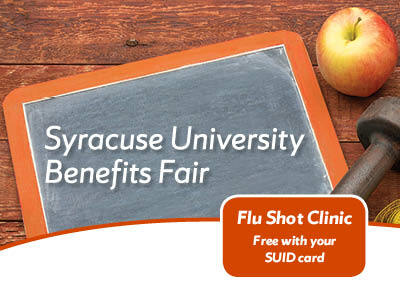 It will include free flu shots with an SUID and is open to Syracuse University faculty, staff and retirees. Complimentary parking is available in Booth Garage and University Avenue Garage, with shuttle service. For directions, visit parking.syr.edu/category/lot-directions. In addition, the Centro Bus Shuttle Schedule (#344) to College Place for employees on South Campus is available from the parking website: parking.syr.edu/transportation/shuttle-information/fall-shuttle-information/.